When I came across this novel at my local library, I was hesistant as the cover was not enticing compared to other novels I had already borrowed on that day. But I gave it a risk as the introductory of this novel was a bit interesting. I was entirely surprised as both the cover and the blurb was no where near in capturing the full story of the novel, meaning I picked a novel that was not a traditional love story. Lou Clark’s life is about being safe, where she loves to work at The Buttered Bun tea shop and is in a long-term relationship with her boyfriend. Suddenly she loses her job and in desperation to find a new one, to provide for her parents and sister, she is hired to become a carer. Will Traynor’s life was full excitment, risks and living on the edge. One day a motorcyle accident changes his life completely, coming from a world of adventure and be able to control his life, Will loses his desire to live. Fate brings both Will and Lou’s life together, as both present personalities collide they learn the meaning of life and love. But as months pass, a decision has to be made that may rip them apart. In my opinion judging a novel can have its benefits, as books like these always suprises me when I finally give it a go. I was blown away by this novel! At the start it was slow to progress into the novel, but once I got introduced to Will I was immediately spell-bound. You can definately see the contrast between Lou’s and Will’s present and past lives and how this aspect is important throughout the book, in regards to character development. The book is structured with different POV which helped give an outside view of the story. 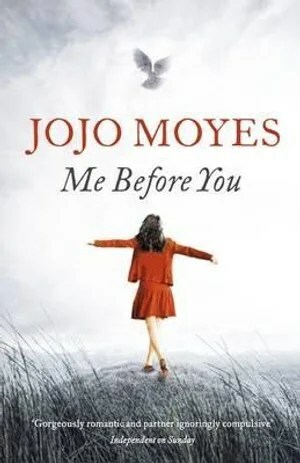 I also found myself veering off to different directions while I was reading this book, as the story makes you understand why things had to happen the way it did, so though it had a main course it had bits where it took you to see a different side of the characters. By the end of the novel, not only I accepted it was not a conventional romance novel, it was like reading a personal diary that follows the growth of Lou entagled with Will’s life. It made me teary at the end as I did not expect myself to be so engrossed with the characters, but also the story seemed so realistic! Controversial topics made me question my life, and if you ever get the change to read it you will definately understand me.